Libraries face a $16 million drop in funding next year under Mayor de Blasio’s proposed $92.2 billion budget, according to the group Invest In Libraries. A recent study, however, showed city residents offering near-unanimous praise for the institutions. Ninety-three percent of those surveyed said libraries were community cornerstones, while 84 percent said libraries deserved more funding, according to data from California-based pollsters Change Research. Nearly all of the 1,034 New Yorkers who responded said libraries were beneficial to disadvantaged and lower-income residents, many of whom lack reliable home internet access in an increasingly digitized world. “This poll reinforces what we already know to be true,” tweeted Queens City Councilman Jimmy Van Bramer, who chairs the Committee on Cultural Affairs, Libraries, and International Intergroup Relations. “Our public libraries are indispensible to our communities,” he wrote. Together, three systems — the Queens Public Library, the Brooklyn Library, and the New York Public Library — administer more than 200 branches across the five boroughs. They are seeking a combined budget increase of $35 million for the 2020 fiscal year, as well as a commitment to $963 million in capital funding over 10 years. City libraries scored a victory in last year’s fiscal talks, with lawmakers greenlighting requests for an additional $76.7 million in expenses and capital funding. 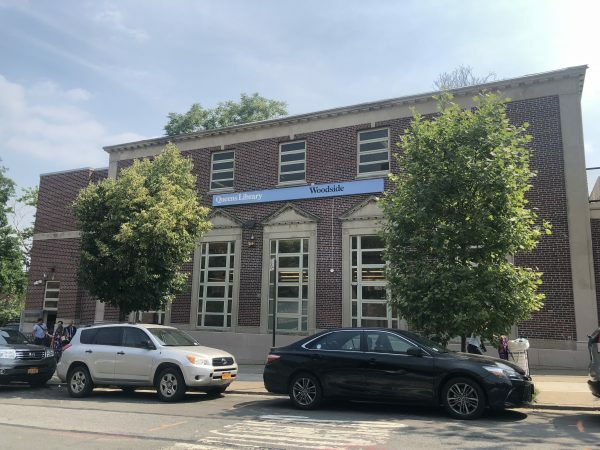 If we’re talking about the Woodside branch… Invest in sound proofing material and respect classes for children and parents. All from the children who run amok in this place in that unpadded, asbestos ridden stairwell, with parents having absolutely no idea how to be parents to their kids. Downvoting means y *are* one of those “parents”. Jimmy instead of tweeting why don’t you do something to stop the budget cuts? I think to raise needed library funds, we should have ‘congestion pricing’ on the Skillman Avenue Bike Path in front of the library. More than a third of the cuts would be made up if the City reapplied system-wide the $6.6 million dollars Jimmy Van Bramer pulled out of his political magic hat to boost Joe Crowley’s campaign against Alexandria Ocasio-Cortez last June, one week before the Democratic Party primary for Mr. Crowley’s congressional seat. Mr. Van Bramer’s sudden announcement of $6.6 million dollars for the Woodside Library, accompanied by Mr. Crowley and Dennis Walcott, the QPL CEO, with no substantive description at the time and even today (4/9) of the work to be done and no indication anywhere of how the $6.6 million dollars was arrived at, constituted a blatant, tawdry politicalization of Queens Public Library functions by Mr. Van Bramer, typical of the back-room dealing Crowley era in Queens politics and Mr. Van Bramer’s way of doing business until Ms. Ocasio-Cortez won the primary. The City should wipe this political chicanery off the books and use the $6.6 million dollars to ameliorate the projected shortfall. The country is getting older and we need places like libraries to keep our seniors busy, social, and safe. Bring in a nurse for health clinics. Teach classes on digital literacy. Fight the epidemic of loneliness that creeps in as people get on in their years. But apparently the others are okay with how this library is right now. The children running amok with absolutely no supervision by so called parents, attitude when anyone else tries to keep them safe, absolutely no way to get any studying or work done. The library should be free for scholars who respect. they also serve free breakfast and lunch too – on our taxpayer dollars. We can’t build bridges if we hand out 3 blueberry muffins! and we give billions in welfare to corporations who don’t ‘trickle’ it down to their workers. Do you hate school lunches, too? Libraries? I know schools do but libraries are news me. This is one thing I’m okay with my tax dollars being spent on. Kids are in school on time and have full tanks. Although, I’m getting sick of them coming into school with ‘lunch’ being Takis and sugar water. Bezosbub is glad Amazon didn’t pay any taxes for 2018. Really? I’ve been a librarian in NYC for 20 years now and the only free food program I know of is the summer lunch program for kids up through age 18, which does not come out of library funds. The lunch, which comes from the same city agency that administers the free breakfast and lunch program in the schools when they are in session. Many kids would not eat lunch at all if it wasn’t for this program. Try to care about those less fortunate. It could be you some day. Learn to take responsibility for your own actions. Most people are poor because they make bad choices, repeatedly. You’ll learn this if you ever grow up. And now many people are too used to having things brought to them instead of working towards something. That’s the result.of your new deal. FDR is spinning in his grave.